Del Mar, CA, May 29, 2014 - Humetrix will participate in next week’s Health Datapalooza in Washington, DC, demonstrating its iBlueButton mobile app which already makes it easy for Veterans to take their records with them and receive the care they need at a private hospital, clinic or VA facility. 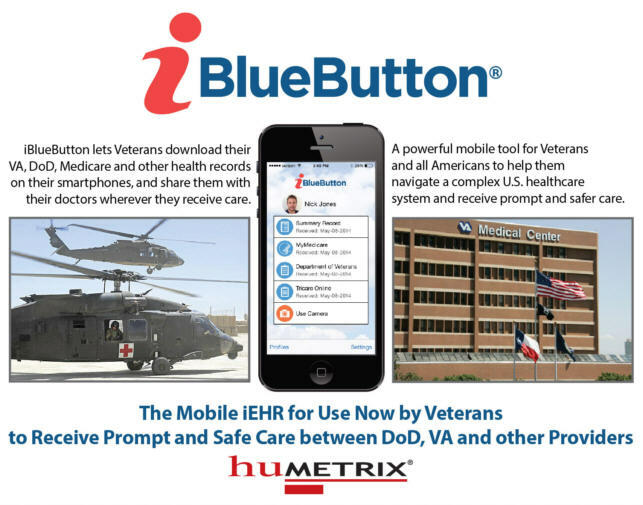 As part of the Live App Demo on Monday, June 2 at 3:00 pm Humetrix will showcase its iBlueButton app with a young Veteran in the emergency room providing his ER doctor with a complete list of medications that were downloaded to his smartphone from his VA and TRICARE records. Suffering from a dangerous interaction between several medications prescribed by different providers, iBlueBlutton provides the ER doctor with the critical information needed for a prompt diagnosis, treatment and positive outcome. Also on June 2 at 1:00 pm, Humetrix will demonstrate iBlueButton in the App Demo Program - a dedicated area in exhibit hall A at the Marriott Wardman Park Hotel. iBlueButton pulls or automatically receives healthcare records from the VA, TRICARE, Medicare or other MU-2 certified EMRs directly on a user’s smartphone or tablet. iBlueButton records are totally secure because they come directly to your device and are not stored on a server where they can be hacked or mined. It uses Blue Button+/ MU standards to parse and receive records via the Direct secure data transport protocol and make them available at any point of care. iBlueButton is available for download from iTunes and Google Play.